Get information about the current status of the policy update process. In case HMI needs to find out current status of PTU and sends GetStatusUpdate_request to SDL, it must respond with the current update status code to HMI. The request GetStatusUpdate duplicates the functionality of the notification OnStatusUpdate. In case the policy update status is being changed.(e.g. 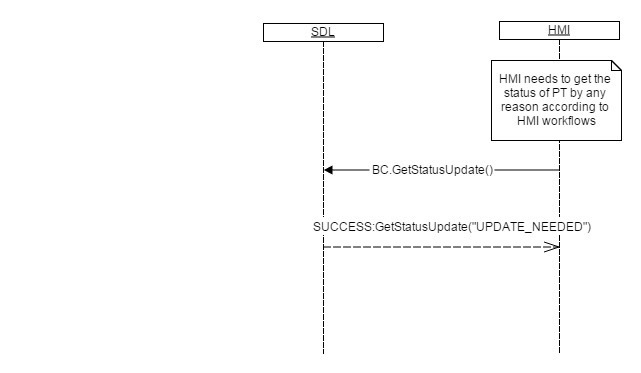 an update is finished successfully or retry strategy failed), SDL must send notification OnStatusUpdate to HMI with the corresponding UpdateStatus code, whereas GetStatusUpdate allowes to request the status of policy table at any time, not on update only. Send a request to SDL if it needs to get a current policy update status according to its workflows.